Ingredients: Cannabidiol (CBD), Olive Oil, terpenes. Softgel capsule: gelatin (bovine), glycerine, water. Purchasing this product will earn you 81 Greenbucks! Cibdol CBD Softgel Capsules 384mg are made from some of the European Union’s finest organic grade hemp, grown without pesticides or toxins. The CBD that is extracted from these plants is pure and effective and is easily one of the best high-end CBD products on the market today. Combining the organically grown hemp with high tech modern and very sterile scientific processes produces a CBD Oil that can be lauded as one of the best. All of Cibdol’s CBD Oils are 100 percent natural and organic, and zero growth hormones are used in the production ensuring you a high-end product just as nature intended. 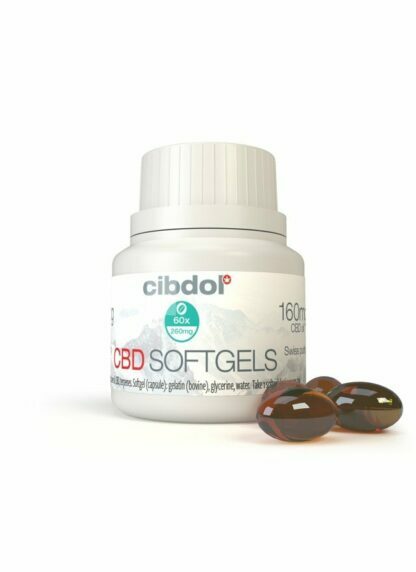 Cibdol CBD Softgel Capsules are lab tested under exacting conditions from seed to shelf for CBD content, cannabinoids, contaminants, bacteria, mould and fungi to ensure your safety and the quality of the hemp extract oil. Our softgel capsules travel with ease and provide the same pure CBD content that Cibdol is known for, with the convenience of individual capsules. Softgels make dosing a breeze: jars contain 60 capsules, totalling 9,6ml of oil with 4% CBD content, which results in a total of 6,4mg of CBD per capsule and 384mg of CBD per jar. Easy to take softgel capsuled. CBD Content: 6,4mg per capsule, 384mg per jar. Olive Oil, CBD, Terpenes, Softgel (capsule): Gelatin (bovine), Glycerine, Water. Allergen Information: None. Take one softgel capsule 2-3 times a day.